Heidi England literally had a hobby turn into a career. Her early training took place at the Houston Museum of Fine Arts. It was later she met and studied with Jo Sonja Jansen in Conroe, Texas. Heidi relates, "It was here that Jo Sonja introduced Folk Art into my life -- and I fell in love with the art form and its history. This was 25 years ago! Jo has been my teacher ever since. This I've learned -- the more you study and learn, the more you realize how much MORE there is to learn! Learning is one of the true joys in my life." Heidi has also studied in Germany and at Vesterheim in Decorah, Iowa. Travel teaching and teaching for the Society of Decorative Painters gives Heidi a chance to share her love of painting with people from all over our beautiful country as well as the world. Heidi has taught in America, Canada, Australia, France, and Japan. 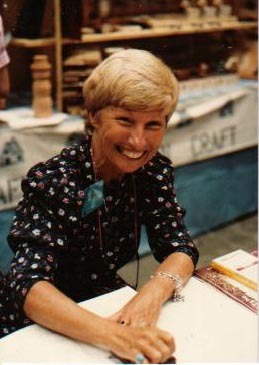 Heidi has four books on the subject of Folk Art. She feels very honored to have been invited to share designs in the "Artist's Journal", "The Decorative Painter", and "Paint Craft" of Japan. She has also developed a line of Pattern Packets. These are available from Cabin Craft Southwest in Euless, Texas, as well as the Lady Bug from Springfield, Missouri. Sharing Folk Art has truly become a way of life! For more information, you can contact Heidi by website, email, phone or address, by clicking here.